A collaboration between Tom Peters of Monk's Cafe and Menno that was brewed in September 2011. A smoked imperial porter that was aged in whiskey barrels with brettanomyces. His beer has a ton of beechwood smoked malt, so it will not have the phenols often associated with peat smoked malt. Rodenbach yeast added later. Tried to be objective as I didnt realize this was a sour until after I ordered. This would have been great without the Rodenbach pitch though - totally ruined this one. 750 mL bottle poured into a snifter. Appearance - Black with no head. Thin collar of foam, though. Smell - Smoke. Dark chocolate. Whiskey. Oak. Fudgy, but with a brightness I can't pinpoint. Taste - And it's sour, how odd. Chocolate, but it's very brief. More roasted malts. Oak. Finishes with a peaty smokey flavor and a lingering tang. Mouthfeel - Heavy. Low carbonation. Sour. Overall - This is one strange beer. It's certainly a unique combination of flavors and I was not prepared for the sourness. The nose didn't suggest it at all. This is one of the most unusual and complex beers I have encountered. I will attempt to do this justice in words. Black motor oil pour with minimal lacing. I smell dark fruits like a strawberry and plum jam, sweet and smoked malts, vanilla, chocolate and some acidity. The smell carries over to the taste. I haven't been a huge fan fan of smoky beers in the past but this one integrates the smokiness into the flavor like my favorite Scotch, Lagavulin 16. The taste is imminently fruity and very much influenced by the rodenbach yeast. The fruit is fresher on the palate than it is on the nose. Fresh berries like BC backyard rye carries into a mild sourness that grows as you sip. There is a little oakiness and vanilla and finishes with some well integrated scotch and booze. I am left with a dry, smoky and woody finish. The mouthfeel is viscous but is lightened by the acidity. Wonderful. This beer is an experience in its complexity and intensity. Memorable and unusual. Perhaps best enjoyed by a warm campfire rather than a bar but I'm not complaining! I love this beer. My only complaint is that it is a touch too sweet for my taste. Served chilled in a snifter. 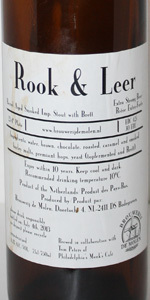 Appearance: Wow, Rook & Leer is the darkest of the recent De Molen beers that I have had - appearing midnight black in the glass and a strong back light revealing only a sliver of deep red along the edge of the glass. A rough pour yields a good sized dark tan coloured head that lasts reasonably well and even leaves a few splashes of lacing clinging to the glass. A light swirl coats the glass in thin alcohol legs. Smell: The initial nose is fantastic, offering loads of chocolate, sweet vanilla, whiskey, oak, and some sweet caramel/toffee. After a minute or two things really starts to open up, with tart cherries, lots of raisin, some earthy leathery notes, a touch of smoked malt, a tart Flanders Oud Bruin character, red wine and a little vinegar all becoming apparent. This is certainly one of the most complex noses I have come across and seems to be in a constant struggle between sweet and tart, with the sweetness just coming out on top. Taste: The flavour is far tarter than I expected, with tart cherries, an earthiness, metallic notes (Flanders Oud Bruin like), musty old wood, red wine and a little vinegar dominating the initial flavour profile. Soon some smoke and leathery notes become apparent, alongside raisins and a little underlying sweetness. There is surprisingly little barrel character present in the flavour and the sweetness from the nose is only present in trace amounts. This is by far the most sour stout I have had and I can't help but think I might have preferred the flavour with a little more of the base imperial stout or barrel character present to balance the tartness and sour flavours. Mouthfeel: The body is just shy of full and seems as if it should have a certain stickiness to it, however the brett seems to have eaten this away resulting in an almost watery feeling in the finish. The carbonation is of a medium-low level and nicely creamy. Overall: Rook & Leer is certainly one of the most interesting beers I have had this year and one I would love to have in the future to see how the brett changes the flavour profile. On a side note I think the tartness in the flavour demands that this be reclassified as an American Wild Ale.